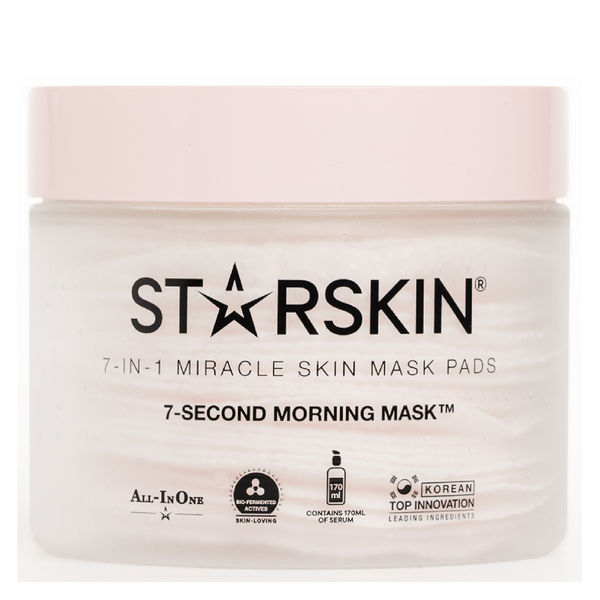 Combine your skincare regime into one convenient pad with the award-winning STARSKIN 7-Second Morning Mask™ 7-in-1 Miracle Skin Mask Pads; a new generation beauty innovation that delivers instant results. Ideal for busy lifestyles, the dual-texture pads are able to massage, exfoliate and tone skin using one side, whilst the other side functions as a serum, moisturiser, leave-in mask and primer. The front side of the pad boasts an array of massaging and exfoliating beads that slough away dead skin cells, promote optimum circulation and leave pores refined. Complete with a dose of toner, the pad balances the complexion and visibly brightens skin for a radiant finish. The back of the pad is soaked with a powerhouse cocktail of skin-boosting ingredients. Enriched with a potent blend of Niacinamide, Sodium Hyaluronate and Adenosine, also known as ‘topical botox’, the pad visibly plumps the complexion to eliminate the appearance of fine line and wrinkles. This side works as a nourishing and protective serum, as well as offering a veil of hydration to the face that maintains skin’s moisture levels. Similar to a leave-on face mask, the pad boasts a slow-release formula that ensures skin is treated to nourishment all day. Ideal for use before makeup application, the pad prepares skin for the day and functions as a primer to enhance the wear and duration of makeup. Expect a bright and radiant complexion that appears healthy and nourished. Front: Use pad to massage, exfoliate and tone skin. Back: Use pad as a serum, moisturiser, leave-in mask and makeup primer. Use both sides for 7-seconds. Water (Aqua), Glycerin, Butylene Glycol, Chamomilla Recutita (Matricaria) Flower Extract, 1,2-Hexanediol, Butylene Glycol Dicaprylate/Dicaprate, Betaine, Niacinamide, Hydroxy Ethylacrylate/ Sodium Acryloyldimeth+H27:N27yl Taurate Copolymer, Aureobasidium Pullulans Ferment, Lactobacillus/Soybean Ferment Extract, Angelica Gigas Root Extract, Ganoderma Lucidum (Mushroom) Stem Extract, Glycyrrhiza Glabra (Licorice) Root Extract, Houttuynia Cordata Extract, Pueraria Lobata Root Extract, Lactobacillus/Milk Ferment Filtrate, Sodium Hyaluronate, Adenosine, Fragrance (Parfum), Achillea Millefolium Extract, Arnica Montana Flower Extract, Artemisia Absinthium Extract, Gentiana Lutea Root Extract, Beta-Glucan.